Scroll down for a tangy, tasty Bourbon Chicken Recipe. Or see the links at the bottom of the page for other popular American entrees. Due to superior road quality and beautiful scenery, motorcycle trips are a popular pastime throughout the state of Kentucky. 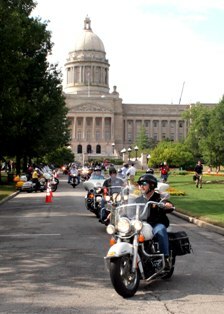 Shown in the above photo (and on the PHOTO QUIZ page) are Kentucky motorcycle tour groups. Many different themed tours are available. Visit historic buildings around Lexington and Louisville, where more than half of the state's population lives. Or ride the Kentucky River Gorge for striking views from 300-foot bluffs. Or tour the abundant tobacco farms, dairies, and thoroughbred horse farms in the famous bluegrass pastures of rural Kentucky. The scenic possibilities are nearly endless in the diverse and abundant ecosystem of Kentucky. Other magnificent natural attractions include Cumberland Falls, which features the only moonbow in the western hemisphere, and Mammoth Cave National Park, featuring the world's longest known cave system. Scroll down for a fabulous, easily prepared chicken recipe featuring Kentucky Bourbon as its key ingredient. For a broad assortment of U.S. destinations, recipe ideas and more, visit any link shown on this page. Place chicken breasts in a 9x13 inch baking dish. In a small bowl, combine the ginger, soy sauce, onion flakes, sugar, bourbon and garlic powder. Mix together and pour mixture over chicken. When you're ready to cook, preheat oven to 325 degrees F (165 degrees C). Remove dish from refrigerator and remove cover. 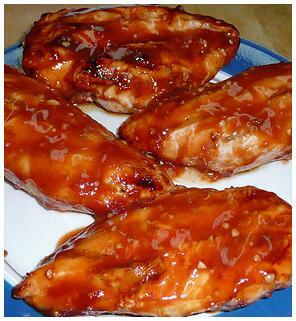 Bake in the preheated oven, basting frequently, for 90 minutes or until chicken is well browned and juices run clear. Visit this link for a broad variety of Side Dish Recipes. See this page for Affordable Trave Deals in all 50 States and Washington DC.